Before we had cars and central air—when carriages and telegrams were commonplace—home windows were used solely for practicality. Of course, we know windows are necessary for light and airflow. But we are well into the 21st century; windows are for so much more than proper airflow and natural light. The windows you choose for your home will strongly influence or define the overall style of your Brampton house. Needless to say: choose wisely. Okay, all dramatics aside, have you given thought to the design perspective you want to achieve with the décor and features in your home? Perhaps you are halfway there: the architecture is right, the furniture is in keeping with the style you aspire to, and even the front door and patio are complete. Now: the windows. What style window goes with the overall design of your home? Brock Doors and Windows has the perfect options for your home. Follow this easy guide on the 7 major window styles so you can choose wisely! One of the most affordable styles. Made of two sashes (i.e. : window panes)—one stationary and one which slides up (open) and down (closed). Perfect for traditional style homes. These are probably the most popular window throughout Canada and the US; comprised of two sashes which slide up and down. So, you can pull one sash down for airflow through the upper half, or you can slide the bottom sash up. This style is also ideal for traditional style homes. Just like they sound! These windows create a “picture” in your living space. These are perfect for providing maximum light without opening to the elements. Usually utilized in living rooms, dens, and four-season porches. Fits perfectly inside any style home. Face toward the sunrise or sunset! Casement windows swing outward on side hinges when opened. Most commonly, these are opened by turning a crank. Add these alongside large picture windows for ventilation and dimension. Beautiful in contemporary style homes. Think: single hung window flipped to its side. The sashes slide on tracks to either side (open and closed). Great in contemporary and industrial style homes. Bay windows are typically used in kitchen areas and master suites because they project outward from the wall and create a cozy alcove and allow extra light throughout the room. Bow windows are often confused for bay windows because of the similar name and concept. These, too, project outward—but only slightly—essentially creating a “mini greenhouse” indoors. Ideal in kitchens for plants and ripening produce. Like casement windows, but turned. Hinges are on the top to allow the window to open outward with a durable handle. Best used for high-up places or country chic and mid-century modern style homes. Still unsure which Brampton, Ontario windows are best for your style? Give us a call with any questions and let’s set up your free consultation! 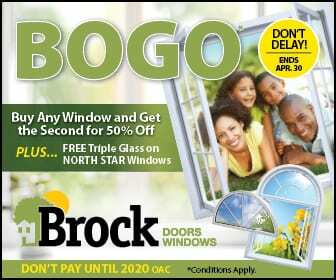 Remember, Brock Doors and Windows can customize windows for your space as well. Together, we will help you create a unified, beautiful look for your Brampton home.